Philips DesignLine PDL-8908 re-imagines TV design | What Hi-Fi? You might imagine all TVs are fated to look the same. Philips sees things a bit differently. TV manufacturers could be forgiven for thinking consumers all want the same thing from a new TV: maximum screen, mininum bezel and a stand to stand it on. Philips, though, wants to offer a genuine alternative – and today has announced the DesignLine PDL-8908. As is apparent from the pictures, the DesignLine TV is unconventional in the extreme. The front of the TV is one seamless, square sheet of glass in 'gradient' black – the aim is to create an impression of lightness and transparency. 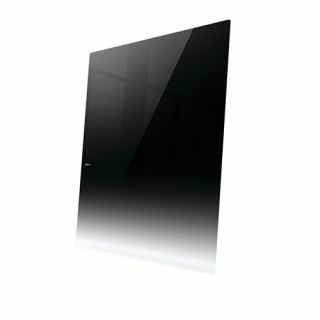 Consequently this is a television without stand or visible frame, one that (when it's turned off) appears to be a smooth sheet of glass (one that flows from opaque to transparent) leaning against a wall. Switch it on, and the top half of that big sheet of glass is revealed to be a 46in or 55in TV. Three-sided Ambilight XL only adds to the 'floating' impression by projecting light that matches the colour of the on-screen content onto the wall behind. The TV itself is a Full HD, active-3D affair, and features Philips' 1400Hz Perfect Motion technology in a drive for ultimate motion sharpness. The PDL-8908 is also a platform for Philips' newly reinvigorated interest in Smart TV applications: it features Catch-Up TV, access to online video stores, internet browser, online apps and USB recording. Wi-Fi is integrated, connectivity is plentiful, remote control is handled via keyboard and pointer, and there's a provision for two-player full-screen gaming. The DesignLine PDL-8908 goes on sale in the second quarter of 2013, priced at £2000 for the 46in model and £2800 for the 55in.